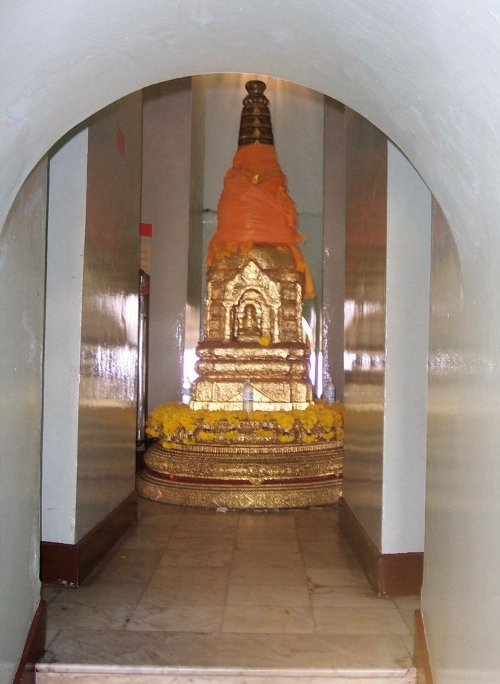 The Golden Mount is part of the Wat Saket temple located just outside the old royal city precincts, next to the Pom Mahakhan fort. The mount has a somewhat unusual history. It was started by King Rama III early in the nineteenth century. He wanted to build a large chedi on the site to mark the entrance to the city. However, the soft marshy ground could not support such a large structure and it collapsed before it was completed. The Golden Mount as seen from the top of the Loha Prasat. Wish you could have this information with you when you visit the Golden Mount? Now you can. Check out our downloadable eGuides. Later on, Rama IV built a small chedi housing a Buddha relic on top of the mud and brick mound. The pagoda was rebuilt again towards the end of the nineteenth century by his son Rama V when the Viceroy of India, Lord Curzon, made a gift of a Buddha relic excavated from the town where Buddha was believed to have been born. The concrete cap was built during WW II to keep the artificial hill from eroding further. Graves on the slopes of the Golden Mount. Although the top of the mount has been encased in concrete, the base is still a jumble of bricks and plaster overgrown with trees and bushes. 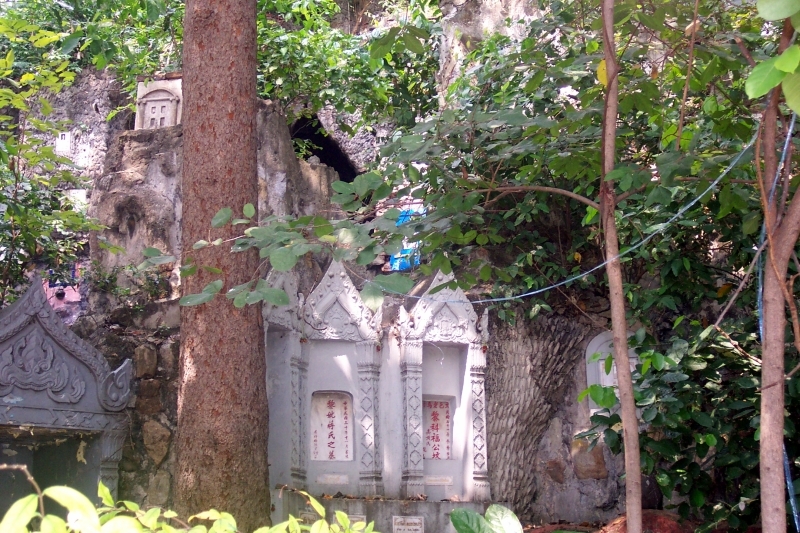 Somewhat curiously, in amongst the vegetation around the base are numerous shrines to departed people. This "graveyard" of sorts includes everything from small plaques to large shrines with Buddha images. The small shrine beneath the roof-top pagoda. From the ground, a wide stairway spirals up and around the sides of the mount. There are about 300 very short steps in all. Its not a strenuous climb, as the slope is quite gentle and there are numerous spots to stop and see something. However, the best time to visit the temple is during the cool season from late November to January, when not only is the temperature much cooler, but the frangipani trees around the base are in bloom, giving off their wonderful jasmine-like smell. One thing to keep in mind before you make the climb is that once you reach the top, there's an admission charge of 10 Baht (0.26 USD) to enter the building and gain access to the rooftop terrace. The interior is a large, rather plain and undecorated room with windows along the outside walls while in the center lies the square outer walls of the shrine. A short stairway in the center of each side leads up to the shrine holding the Buddha relic, which lies directly under the chedi on the roof. The shrine is encased in many layers of gold leaf applied by the devout for more than 100 years. In the back right corner of the room as you enter is a narrow stairway up to the roof. The first thing you will see upon emerging onto the roof is the huge chedi covered with thousands of gold mosaic tiles. From the rooftop terrace you have a 360 degree view of Bangkok. To the west you can see the towers and rooftops of the Temple of the Emerald Buddha at the old Grand Palace. Closer in you can see the tips of the Democracy Monument as well as the peaks of Wat Ratchanadda. To the northwest you can see the single pylon of the new Rama VI bridge with its golden threads of suspension cables. Looking east you can see the towers of Bangkok's business district. If you exit via the back entrance to the temple, you come out onto a street lined with wood shops. The sights, sounds and smells can be worth a stroll. This is also the easiest way to walk from the Golden Mount to Wat Ratchanadda. Turn right as you exit the temple and walk past the fire station. You'll come to the intersection of two canals and about six streets. Continue on the bridge to your your left over the canal and past the Pom Mahakan fort. Cross the street to Rama III park and you'll see the Loha Prasat in the background. The Golden Mount is the location for an annual temple fair held every November. During the fair, a candlelight procession snakes its way up the mount in the early evening hours. Getting to the Golden Mount can be a bit difficult. It is not close to any tourist-friendly transportation, such as the Skytrain or river boat. The best option is to get a taxi from your hotel. That can sometimes be a bit difficult, so you can also try taking the Chaophraya Express Boat to the Memorial Bridge pier, then take a taki or tuk-tuk from there. The Golden Mount is the starting point of our walking tour of the eastern wall of old Bangkok.